Your Donation will be Matched - Help Us Double the Dollars! 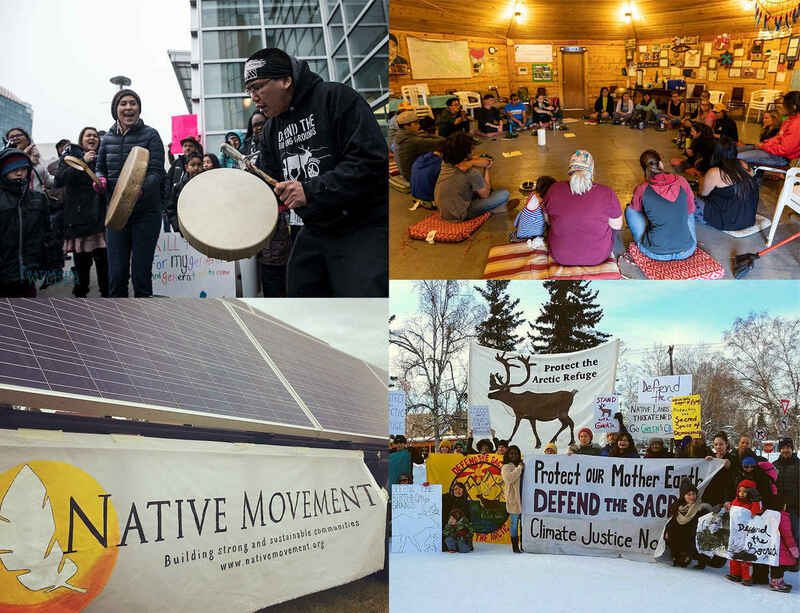 This holiday season we invite you to support Native Movement in our work to dismantle oppressive power systems and address some of the most pressing issues of our time. Native Movement is proud to have had a part in cultivating a growing movement for justice across Alaska. You have the opportunity now to support Native Movement's work double time! We have a supporter who has offered to match all the donations made between now and the end of 2018! With your help we have continued our critical work building grassroots leadership, maintaining resistance to harmful development that threatens food sovereignty and subsistence rights, and advancing a just and equitable vision for Alaska. This past year Native Movement hosted numerous community organizing trainings, reaching hundreds of Alaskans. In addition we co-hosted our wildly successful second annual Northern Organizers Summit, focused on "Art in Action." We have stood firm in the work to protect Indigenous rights and the rights of Mother Earth, particularly around the fight to protect the Arctic National Wildlife Refuge and Alaska's coastal zones and oceans. And Native Movement has been key in building the momentum of an Alaska Just Transition dialogue building toward a fair and equitable "new" economy. While we have made waves throughout Alaska this year, the road ahead has many challenges. There is no doubt that these are times of huge uncertainty. Native Movement knows that change is inevitable and we are committed to continuing to be a guiding light on the path of justice. Our ancestors understood that valuing our connections and interdependence was key to our sustainable ways of life. As part of our extended community, we invite you to contribute to help this important work move forward. Mahsi' choo, Quyanaq, Tsin'an, Enaa Basee', Ahé hee' - Thank you for helping us build this movement! We welcome you to visit our offices (Fairbanks and soon Anchorage! ), meet our Native Movement family, and dig your hands into shaping the movement with us! Thank you for all of the important work you do! From Three Pork Hill and G.A.L.A. in Ossipee, NH. I'm a non-native who found a sense of belonging on Little Diomede, many years ago, and am committed to the well-being of the Bering Strait villages. Thank you for the amazing work you do! Thank you for including me in the event at the Writer’s Block. I am humbled and honored to be here. — Indra. Instead of exchanging gifts at Christmas our family members choose a charity to donate to. This year our daughter, Sarah, chose Native Movement. In honor of beautiful artwork by Mario Fong for the FCAC, GSC, NM Arctic Refuge prayer vigil flyer. I believe in the sacred mind/body/land connection and am so grateful for Native Movement's work to defend our waters, wilds, & rights. Fa'afetai lava. Our daughter Emily has shared so many wonderful stories of your amazing group. Thank you for the way you make our world a better place.